Description of "An Independent Author’s Checklist: FREE Help for Indie Authors (eBook)"
So many people are publishing books of all kinds nowadays, and they need guidance regarding best practices with everything from writing to publishing to selling those books. I've made it my life's mission to help these people navigate this mysterious business littered with acronyms, peculiar old-fashioned practices, and unforeseen pitfalls. As a bestselling author and TESOL certified sales coach for authors with 25 years’ experience in the North American English book publishing industry (in both the traditional and contemporary markets), I can show you how to write, publish, advertise, sell, market, and publicize your book(s) using all the effective traditional and online tricks of the trade. Add my substantial advertising sales and marketing background into the mix, and you have a serious mentor in front of you who can help you achieve commercial success as an author in the traditional "bricks and mortar" bookstores as well as online. 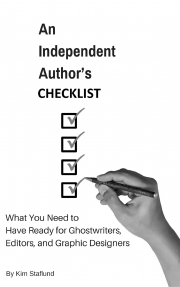 Reviews of "An Independent Author’s Checklist: FREE Help for Indie Authors (eBook)"